This will probably not come as a surprise to anyone who reads this blog but railroaders have bad days. Sunday was one of those days for the herder. Sunday’s herder was moving some power from the Vancouver roundhouse to the yard tracks in the port. Just to make things interesting, the switches at Vancouver were acting up and throughout the morning the dispatcher was unable to line them. When the herder showed up wanting to go down the hill the dispatcher gave them authority to go from the tail to the hill past the signal displaying stop indication. So far so good. When the herder moved off the tail track things went wrong. The dispatcher’s instructions were quite specific about which switch needed to be lined though the instruction left out the fact there are two switches in the plant. The herder crew lined the switch the dispatcher noted but not the other and ended up running the lead trucks of the 5305 through the second switch. Oh oh. In the photograph below the herder conductor is talking with the conductor and brakeman off a yard job that was also sitting on the tail track. I think the conductor’s hand motions pretty much sum up his feelings about what happened. Fortunately the only thing injured in this whole thing was a switch and a bit of productivity. It always seems to take a major disaster to get people’s attention. I’m no different. I’ve been putting off creating a household inventory for, oh, 20 years now. After a good friend and his wife had their camera gear stolen from their vehicle I decided I’d better take their advice and put together an inventory of the gear I use when I’m railfanning. Using the KISS principle I threw together a simple spreadsheet that contains the columns shown above. I then methodically proceeded through the camera bag documenting all the pieces including CF cards, extra batteries, remote cables, and lens hoods. I obviously included serial numbers where applicable. In many cases I filed away the original receipts in the fire safe so I pulled those out and documented the date of the receipt so I could locate it quickly. After an hour and a half I had a complete inventory of my camera and radio gear that I use while railfanning. Its not a household inventory but is one step towards one. My hope is this data slowly rots in the fire safe and I never have to use it. If I do need it though I’ve got it all in one place. April 20 marks seven years for me of using a digital camera to capture railfan photos. Seven years seems like an odd milestone doesn’t it? 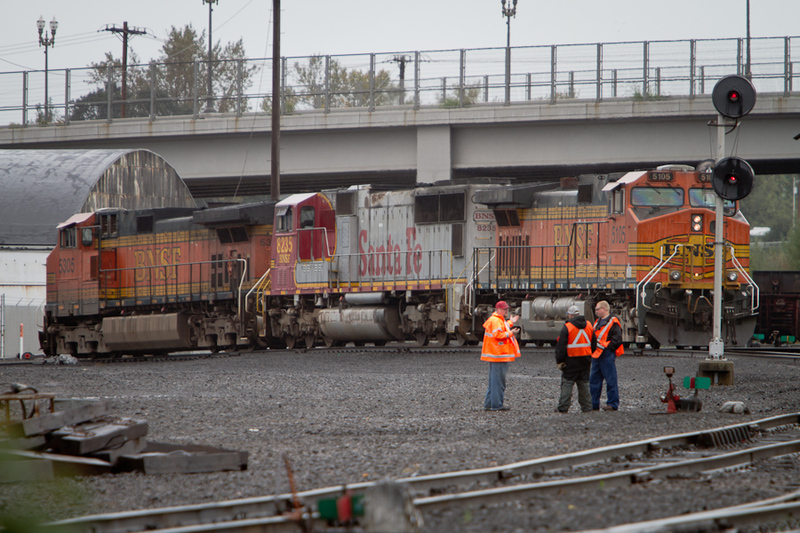 As I thought this through I realized seven years represents about one third of the time I’ve photographed trains. When you do something the same way one third of the time you get used to it and it becomes natural. The morning of April 21, 2001 was quite busy on the Lakeside Sub. The plethora of trains would later come in handy for the 700 and crew. I purchased a Kodak DC4800 3.1MP camera as a Christmas present for my wife in November of 2000. After Christmas I used the camera a little bit for railfanning around Vancouver but I hadn’t yet taken it on a week long trip. I stole the camera away from her for my trip to Spokane and back to chase the ill-fated Homecoming Excursion. With that bit of thievery this trip became my first time using digital to capture railroad images on a road trip. April 22, 2001. Still on the rails. This day would be the last relatively good day of the excursion. What did I think? Well, unlike some, I didn’t waffle back and forth between film and digital. My experience on this trip convinced me digital is where it is. Despite being a point and shoot, the 3.1 MP camera did a fine job and captured some great memories for me. Its ease of use, instant feedback, and ability to correct photos really sold me! On top of that I was still used to prints so I did print some photos…but only the ones I felt were worth the cost. These advantages were too great to ignore and I never looked back. Seven years later digital imaging seems so natural that I feel like I’ve been doing it all my life. Well, it was finally time. In the middle of downtown San Francisco I decided Joleen and I were going to get our Digital SLR Finally. Already we’ve blazed through about 600 pictures figuring out various things about the camera. San Francisco being an awesome place to do just that. Over the next couple of weeks I’ll be pulling some of our “ok” newbie pictures out of the lot and posting them online. Of course at this stage of learning about the camera I like about everything that comes out of the thing. I also will definitely have some street running light rail shots of the MUNI LRVs coming up. Unfortunately I haven’t shot much heavy rail yet, lacking the opportunity. Within the first day of shooting I already have had warnings and interrogations about what I’m taking pictures of. America’s paranoia is definitely two things; lame and absurd. My friend Mike and I had a conversation with a member of San Francisco’s SWAT Team that patrols the corridors of the BART System. Mainly after being reprimanded for taking a picture or three of the platform. Maybe I’ll post those just to be hard headed. Anyway, beyond the interesting experiences, fun learning lessons, and the rip roaring fun of San Francisco I must finish this entry for now and am looking forward to many great pictures and future postings of said pictures in this space! So cheers, I’m stoked to finally have joined the Digital SLR crowd!